Lahti International Show had 24 Glen of Imaal Terrier entered. Best of Breed was Gleann Ode and BOS Gleann Uaid MacDonald. 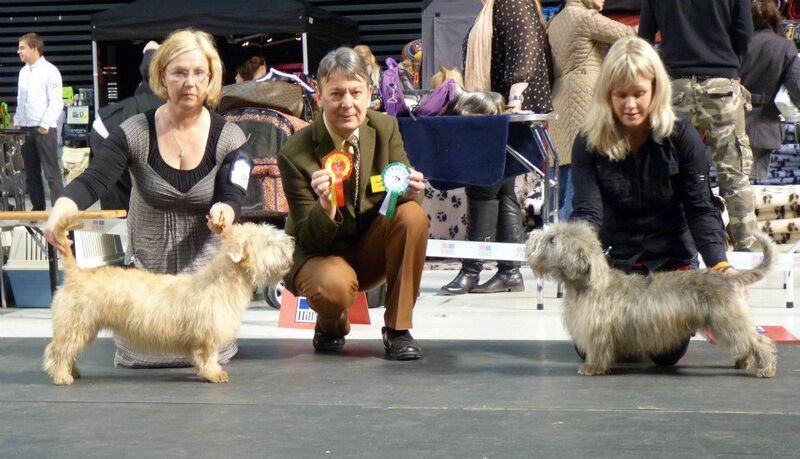 Kennel Gleann was also Best Breeder Group. Nice show indeed for Tiina! Last Monday the Government announced a further consultation on changes to dangerous dogs laws. 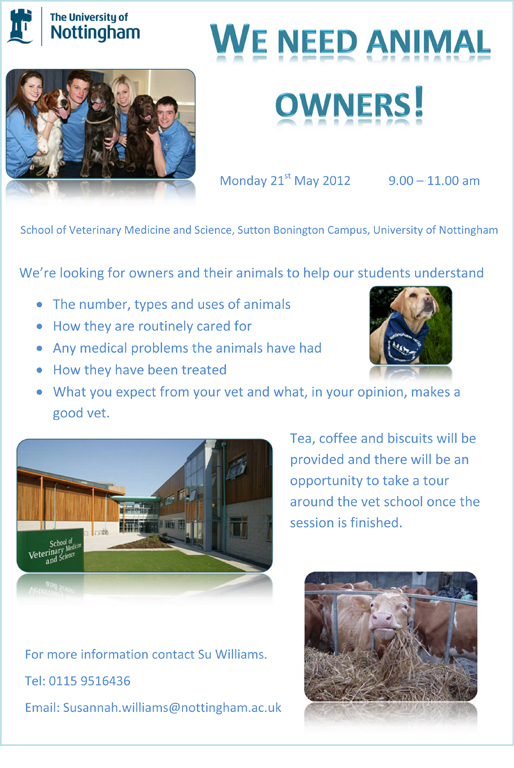 Anybody in reach of Nottingham? Just had to share a note about Winston’s (Finnabair Winston O’Reilley RN BN)new title. 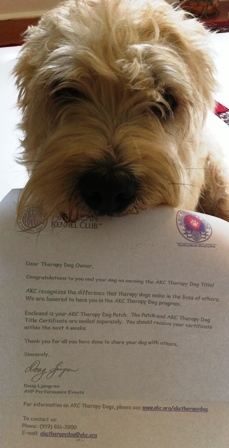 Today we received a letter from the AKC confirming Winston’s Therapy Dog title or THD. Winston and I became Pet Partners with the Delta Society last year and we have been making therapy visits to local sub-acute and Assisted Living Facilities. The dog and handler team must complete 50 visits to earn the title. Winston and I are still visiting and his visits are very rewarding. I never knew how meaningful our visits were until one of our favorite residents( I will call her Mrs C) passed away at one of the facilities where we visit regularly. Mrs C noticed that Winston was watching a Western on her TV one day at a visit and she always tried to find a Western for Winston every time we visited after that. She passed away a few months ago and she had no family and there was no service for her. I know that the visits from Winston were really enjoyable for her and I am so glad we could visit her and make a difference. I still find myself stopping outside her door to visit and then remember she is not there. The first day we visited after she was in the hospital, Winston stopped at her door and sat as we were walking down the hallway to her room. Even the activities coordinator noticed! I know his visits added a bright spot to her day and mine. It is so rewarding to see the residents smile and call Winston’s name. They may not remember my name but they always remember Winston’s! Just wanted to share another way that these great Glens can have an impact. 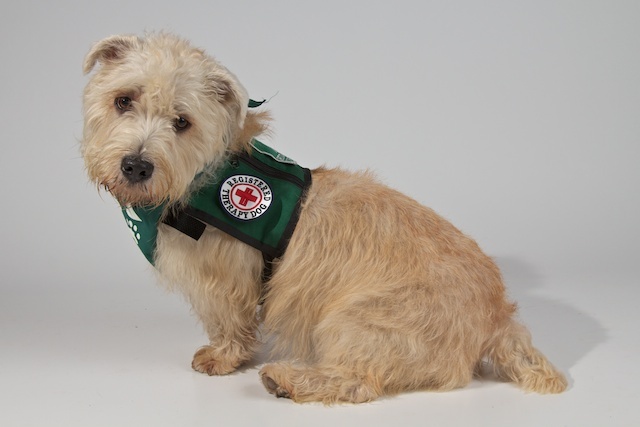 PD (1)1 George & Sullivan’s Romainville Billy Wizz, very promising wheaten, loved his head & eye, strong muzzle, good bite, well placed shoulders, good depth to body, correct angulation, moved with drive. Should make up. BP & RCC. PGD (3) 1 Brown’s Jeonty Dinky Doughnut, broad skull, strong muzzle, dark eye, ample muscular neck, moved freely; 2 Horton’s Jeonty Highlander Boy, typical head. Would prefer slightly better lay of shoulder. Good depth, excellent coat & condition, moved well going; 3 O’Hanlon & Montford’s Pajantick Jimmy Mack. LD (4) 1 Ashcroft’s Romanville Typhoon, broad skull. Would prefer slightly better rise. Correct angulation, moved true both ways; 2 Hadley’s Donvaleset Rebus, excellent type, correct rise. Lost out to 1 in movement; 3 Welch’s Romainville Brannigan at Brockland. OD (7) 1 Welch’s Ch/Int Ch Brockland Brayhead Lad, quality blue that |I have had the pleasure of seeing before. Excellent head shape, correct bite, big teeth, loved his topline slightly rising to strong loin, excellent hindquarters, good jacket. Didn’t quite move so well in front for BOB. CC; 2 Garner’s Johnny Be Good at Romainville, wheaten, pleasing head & ears, excellent bite, correct rise, good depth, covered the ground well; 3 Hardy’s Amhard Damson Sauce. PB (4) 1 George & Sullivan’s Romainville Jean Genie, good for size blue, excellent head shape, lovely eye, promising body shape, should do very well; 2 Hardy’s Ahmard Ginger Snap, promising wheaten, loved her body shape. Just slightly preferred front feet of 1;3 Hannington’s Romainville Uptown Girl. PGB (2)1 Withers’ Romainville Aoife at Pajantick, top quality wheaten, good for size, gorgeous head & eye, strong muzzle, correct bite, well placed shoulders, excellent topline rising over strong loin, in excellent coat & condition, couldn’t stand wrong. Moved so well & what a showgirl. CC & BOB; 2 George & Sullivan’s Romainville Inki, blue, correct forehand, very good body shape, covered the ground well. A pleasure to see her move. LB (3) 1 Baldock’s Jeonty Maybe Daysee, typical head shape, correct front, in excellent muscletone, very god coat, moved freely; 2 George & Sullivan’s Romainville Lily, pleasing head shape. Would prefer slightly better front. A little heavy. Moved with drive. OB (5) 1 Rogers’ Ch Winnie Wanna Make Music by Jeonty, classy wheaten, excellent head shape, ample neck, correct topline, excellent hindquarters. A pleasure to see her move. RCC; 2 Harley’s Ch Donvaleset Brier, wheaten, pleasing head & eye, good depth, covered the ground well;3 Sage’s Jeonty Lola May at Wickholm. Glen of Imaal Terrier people have been certainly strutting their stuff. Timonium (Maryland) had a cluster weekend with a great entry of Glens over all three days. GCH Cill Dara’s Fergus of Daulton was Best of Breed at Columbia Terrier & Old Dominion Kennel Club of North Virginia with GCH Rainbow Springs Wicklow’s Warrior of Ber-D-Mar taking Baltimore County. At Tallinn Winners BOB was awarded to Gleann Una Noonan with BOS going to Pearytail Armcandy Andy. 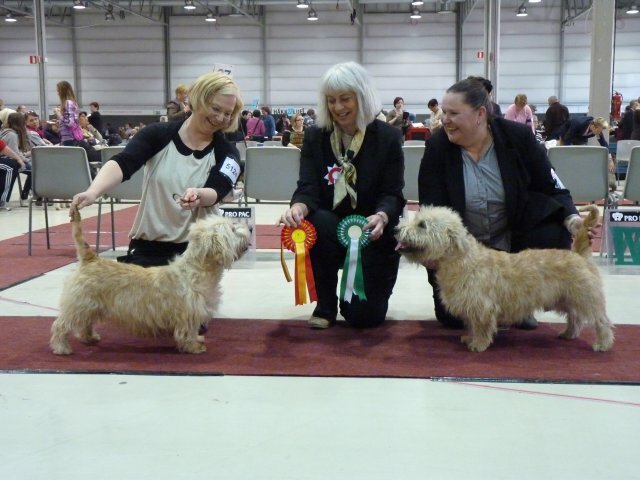 Bainbridge All Breed Show saw Multi Ch Abberann Conan waved into the Terrier Group 4 spot. At Birmingham Gundog & Terrier Johnny Be Good at Romainville was Best of Breed. Congratulations everybody!